Near the exit at the end of the express way in Shimanto township, there is a crowed place. Some people are eating grilled pork and ice cream, sitting and talking and smoking. In the wooden building, some local agricultural products are sold and there is a restaurant. There is a wonderful place of natural bueauty. It is “Agri-Kubokawa”. There are now many michinoeki , “road side shopping areas”. They are not only for resting but also usually sell local products and have a restaurants which serve local food. Each michinoeki tries to be unique and “Aguri-kubokawa” is no different. “Agri-Kubokawa is filled with local food” said Ayu Kunimoto “and if people go there, they can enjoy all of Kubokawa”. The name of “Agri-Kubokawa” is come from “agriculture” and “Kubokawa” which is the name of the area. Their motto is 「窪川まるごと召し上がれ(kubokawa marugoto meshiagare)」（Try to eat all Kubokawa）. It is easy to imagine from their motto, that they focus on is the local agricultural products. They sell not only vegetables, but some processed products which are made from famous agricultural ingredients such as milk, rice and ginger. For example, ginger ale which is strong taste of local ginger, milk ice cream which taste very vivid and rice-bread which is made from Niyodo-mai, famous rice brand. People can feel whole Kubokawa when they visit. “I’m very happy with fortune around me.” the president of Agri-kubokawa answered to the interview of Kochi newspaper when the total number of people who visit Agri-Kubobawa exceeded 6 million last year. It’s not only for the delicious foods, but also the location. Agri-kubokawa is located at the end of the express way, so all the car must pass in front of Agri-Kubokawa regardless of the ultimate destination. 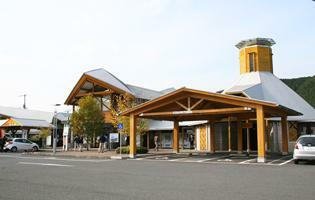 If drivers feel tired and want take a rest, Agri-Kubokawa is very attractive due to its location. This is the one of the reasons. There is another reason which is the biggest and most reasonable―it is the name value of Shimanto. It is often said that “Shimanto-river is the last clean stream in Japan”. It is very attractive to people who are working in urban area to soak up the natural environment. Around Agri-Kubokawa, there are some famous sightseeing spots. For instance, Ittohyo-Chinkabashi. It is a famous unique bridge over Shimanto-river. People can dive into the clean river. Near the bridge, there is Matsubagawa hot spring. The view from the bath outside a room is great. The river river is quietly streaming inside the mountain, the only sound there is. These sightseeing spots are very attractive for people living in urban area. Surrounded by such nature, people are interested in its agricultural products. Then they seek for it and reach Agri-Kubokawa. “Most of food such as pork and rice served in the restaurant in Agri-Kubokawa are made from local products” said Ayu. People can enjoy the wonderful local food, and they think they want to visit there again and again because of the great nature and delicious foods. In short, Agri-Kubokawa is one of the sightseeing spots in Shimanto town and each spot are interacting and supporting each other to promote Shimanto town. “We cheer up the town” these are the words on their home page. Agri-kubokawa welcomes all tourists and helps them enjoy Shimanto city with local delicious products. It sounds really good and makes me to try eating every products! I think Aguri-Kubokawa is one of famous michinoeki in Kochi. I hope many travelers go and eat delicious food at there. I’ve visited Agri-Kubokawa twice before. And as this article said, there are a lot kinds foods and we can enjoy to eat. I hope more people feel free to visit there while driving to take a rest. And these kind of place is rare for me because I’m from Hyogo that is a city. Whenever see the michinoeki, I am made to drop by there. I like the atmosphere and the products of course! Every products are tasty. It was the first time that I heard of Agri-kubokawa. The Kubokawa itself is just followed by the Agriculture. So I can understand that Kubokawa has local products and they must have vegetables and fruits. This simple “Agri-” can make the whole impression of the Kubokawa. How great? I wouldn’t know this intesting story of Kubokawa! I read another article of Niyodo river from Life in Kochi, and I thought it would be cool if this and that article collaborate.